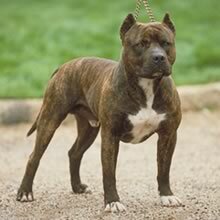 The American Pit Bull Terrier (also known as ‘Yankee Terrier’, and closely related to the American Staffordshire Terrier) derived from crossing Bulldogs with an older Terrier line. The American breed was recognized as a distinct breed in 1936. American Pit Bull Terriers became popular with ranchers and farmers for protection, companionship, and catching hogs and cattle. Despite its media reputation for ferociousness, the American Pit Bull Terrier is an affectionate dog which has risen to popularity as a pet. The American Pit Bull Terrier’s natural aggression is directed toward other dogs, not humans, and even this can be overcome with training. They often serve as search dogs or police dogs. The American Pit Bull Terrier has a shoulder height of 46-56 cm (18-22 in) and generally weighs between 30-70 lb. Pit Bull sizes do vary, however, and so more important than actual weight and size is the dog's proportion. American Pit Bull Terriers have highly set, pointy ears which may be cropped, a broad head, wide cheeks, short back and tail (undocked), and wide, straight forelegs. They are very stocky, muscular, and powerful. The American Pit Bull Terrier has round eyes and teeth that form a scissor bite. Unlike the American Staffordshire Terrier, they are allowed nose leather of any color. The American Pit Bull Terrier is usually taller but with smaller head and bones. The American Pit Bull Terrier has a smooth, glossy and stiff coat. Any color coat with any color pattern is acceptable for the American Pit Bull Terrier, with the exception of Merle. The American Pit Bull Terrier sheds an average amount. The American Pit Bull Terrier is loyal, tough on itself, and tenacious. It has a lot of stamina and makes a good watchdog. American Pit Bull Terriers exude strength and agility. They are stubborn and fearless, but very gentle and kind with family. The American Pit Bull Terrier is loyal, tough on itself, and tenacious. It has a lot of stamina and makes a good watchdog. American Pit Bull Terriers exude strength and agility. They are stubborn and fearless, but very gentle and kind with family. Provided proper socialization has taken place, the American Pit Bull Terrier gets along fine with children and with cats or other household pets. Behavioral training and rearing alongside other pets is important for socialization, otherwise they may be eager to fight other dogs, especially when challenged. They make great home protectors. The American Pit Bull Terrier is usually friendly with strangers when their owners are present. It makes a good family dog as long as the family can handle its boisterousness. It highly desires its owner’s attention and approval. You can find Pitbull Terrier puppies priced from $120 USD to $10000 USD with one of our credible breeders. Browse through our breeder's listings and find your perfect puppy at the perfect price. Provided proper socialization has taken place, the American Pit Bull Terrier gets along fine with children and with cats or other household pets. Behavioral training and rearing alongside other pets is important for socialization, otherwise they may be eager to fight other dogs, especially when challenged. They make great home protectors. The American Pit Bull Terrier is usually friendly with strangers when their owners are present. It makes a good family dog as long as the family can handle its boisterousness. It highly desires its owner’s attention and approval. The American Pit Bull Terrier’s coat should be cared for by removing dead and loose hairs periodically with a rubber brush. American Pit Bull Terriers can live outdoors but prefer indoor life with a family. Be sure to keep the dog attended outdoors due to public perception. American Pit Bull Terriers live 10-12 years and have litters of 5-10 puppies. The American Pit Bull Terrier must be taught at an early age not to pull on the leash, as it becomes very strong when fully grown. It can learn a great deal if consistently trained. Intense socialization at an early age is important. American Pit Bull Terriers are obedient and have a very strong desire to please their owner. Training should be patient, respectful, and firm. The American Pit Bull Terrier needs plenty of exercise. It enjoys running alongside a bicycle or catching a ball or Frisbee. It also enjoys playing fetch. The American Pit Bull Terrier can live in an apartment as long as sufficient attention and exercise is provided. Pitbull Terrier Puppies for Sale - Shipped Worldwide! Finding the right Pitbull Terrier puppy can be dog gone hard work. PuppyFind® provides a convenient and efficient means of selecting and purchasing the perfect Pitbull Terrier puppy (or Pitbull Terrier puppies) from the comfort of your home, 24 hours a day, 7 days a week. Take advantage of our PuppySearch or leisurely browse our directory of hundreds of dog breeds, Pitbull Terrier dog breeders, Pitbull Terrier dogs for adoption, and Pitbull Terrier puppy for sale listings with photos and detailed descriptions. Some Pitbull Terrier puppies for sale may be shipped Worldwide and include crate and veterinarian checkup. Many Pitbull Terrier dog breeders with puppies for sale also offer a health guarantee. With thousands of Pitbull Terrier puppies for sale and hundreds of Pitbull Terrier dog breeders, you're sure to find the perfect Pitbull Terrier puppy.